This spring will be a season of transition for Buildings & Landscapes. And a good time to pause and take stock of the evolution of the journal over the past six years. With the spring issue of B&L, Marta Gutman completes six years as co-editor. Fortunately for the VAF, a scholar of equal quality, Anna Andrzejewski has agreed to take her place. At the same time, Andrew Sandoval-Strausz is stepping down after six years as review editor to be replaced by Matt Lasner. The Vernacular Architecture Forum’s first scholarly publication, Perspectives in Vernacular Architecture, appeared every two or three years, totally fourteen volumes between 1982 and 2006. The organization chose to replace that series with an annual journal, Buildings & Landscapes, in 2007. The first coeditors, Howard Davis and Louis P. Nelson took it to two issues a year in 2009. Since the Spring 2010 issue, Gutman and Sandoval-Strausz (working with B&L co-editors Nelson, through 2012, and Cynthia Falk, starting in 2013) have brought increased scholarly breadth and depth to the journal. While a steady flow of articles on colonial to nineteenth century American topics, on fieldwork and preservation continue traditional VAF interests, the editors also have worked to reflect the growth of vernacular scholarship on the twentieth and twentieth centuries, on urban and suburban settings, on Latino and Asian cultural landscapes, and those of African Americans since slavery. The addition of two or three articles a year on international topics parallels the much expanded coverage of South Asian, African and Latin American work that Sandoval-Strausz has built into the review section. “The two main changes,” wrote Sandoval-Strausz in response to my email query, “are the increase in the absolute numbers of reviews, and the geographic diversification.” From four book reviews in a typical early B&L issue, one now finds eight to ten reviews per issue. Likewise, the expansion of the journal from 120 to 184 pages during this period has also accommodated new columns, the Viewpoint essay, Research Notes and Object Lessons. A more robust B&L presence on the VAF website includes the contents of past issues, along with manuscript preparation and submission guidelines. Behind this public face, procedures for peer reviews of manuscripts, the preparation of the digital edition and of article images and supplemental visual material (hosted by JSTOR) have been standardized. Starting as the first Image Editor in 2014, Emily Rinaldi now coordinates technical specifications and permissions. The synergy between the annual VAF conference and Buildings & Landscapes (and before it, Perspectives), it seems to me, have been essential to the organization’s vitality. Many attend a first conference and deliver a paper. They mature intellectually, in part, by working with the journal editors to turn that talk into a first scholarly article, then move into leadership roles in the organization. The number of past contributors to B&L now serving on the board is a testament to the importance of the independent voice of B&L within the VAF. We owe a particular debt of thanks in this season of transition for Buildings & Landscapes to Marta Gutman and Andrew Sandoval-Strausz for their hard work and intellectual vision. Welcome to the Winter edition of the Vernacular Architecture Newsletter (VAN). In this quarterly issue you will find lots of wonderful stories about new digital resources ranging from books to photo sharing to online resources for teaching, as well as reflections on conferences past and future. And don’t forget to check out the dynamic conference website for our VAF conference in Chicago http://www.vafchicago.org/. Hope to see you there! I would like to invite any member to submit an article, news, or resource that you would like to share. Please feel free to send them to me at vaneditor@vafweb.org The newsletter is a great way to share your ongoing research or resources you have found useful in your practice. I would especially like to solicit information about upcoming field schools for the next issue, due out in April. Please send articles, short or long, reflections or announcements on vernacular architecture field schools, and we will compile it into our first field school themed newsletter. I think it will be a great way to share these unique learning opportunities among our membership. Please send me your submissions by March 15. The VAF’s recently revamped website features a new page called Tools for Education developed by the Education Committee to complement the existing Tools for Advocacy page. This resource is aimed at professors, teachers, and students looking for an introduction to Vernacular Architecture studies – a “Starter Kit.” It gives newcomers a way to locate the VAF’s approach among various academic fields and methodologies, while also providing practical resources for the classroom and the field. Visitors to the Tools for Education page can download thematic slideshows as the basis for classroom presentations or curriculum development. The slideshows feature high-quality fully credited photographs mostly taken by veteran VAF members at annual conferences around North America. Detailed information and a suggested narrative appears in the “notes” section of the slideshows and can be used word-for-word or as inspiration for related projects. One slideshow currently available is based on Thomas Carter and Elizabeth Cromley’s Invitation to Vernacular Architecture. 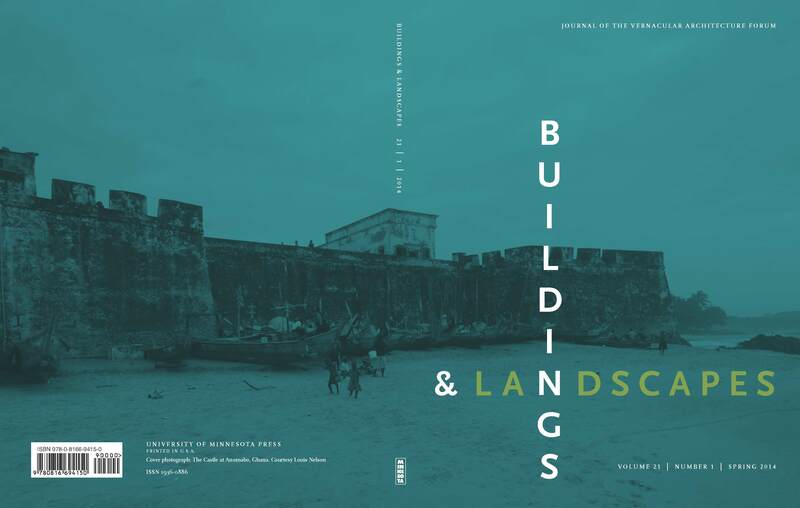 It provides useful definitions and an illustrated tour through a wide range of buildings and landscapes, and also celebrates close looking and object-driven analysis. In the coming months, we will add an additional slideshow about doing fieldwork, which is at the heart of the VAF’s mission. We also plan a “Close Looking” series that will draw images and in-depth research from past VAF conferences. Over the years, conference guidebooks have featured incredibly rich and otherwise unpublished documentation of buildings and landscapes. For teachers without the resources, experience, or geographic proximity to an area of interest, these slideshows will provide high-quality photographs and interpretive materials to help them incorporate vernacular architecture into classroom activities, student projects, and their overall curriculum. “Tools for Education” also provides a growing list of other recommended online resources and potential textbooks. This new “Tools for Education” resource can be found under the website’s Learning tab, along with our ongoing Syllabus Exchange and Vernacular Architecture Reading List. All of these will continue to grow so please check back often. Thank you to Education Committee members past and present who helped initiate this page include Elaine Jackson-Retondo, Sarah Lopez, and Thomas Hubka, also to David Bergstone, Susan Garfinkel, and the website committee. The VAF wants to help teachers and college professors use buildings and landscapes in their classrooms and we hope these resources will prove useful. We welcome your feedback! Please direct it to sfscarle@mtu.edu. If you missed the 2013 Gaspé-Percé VAF, or just want to revisit some of the resources, I'd like to let you know that the field guides are now available online. The seven highly illustrated booklets interpret the buildings, sites and landscapes of the eastern-most tip of the Gaspé Peninsula. The authors draw upon primary sources including historic photographs, postcards, interviews as well as field recording to present each site on the tours. The contents showcase five editions of the Université Laval School of Architecture Field School in Built Heritage and Cultural Landscapes, community-based projects, and intensive documentation campaigns under the supervision of Tania Martin. While we have obtained permission to “publish” the booklets, use is restricted for educational, private study or research purposes, provided the source of the images and/or texts is clearly indicated. If you wish to reproduce any of the images taken from archival sources (i.e. a historic photograph) please obtain special permission directly from the holder (museum, individual, etc.). Also, we are working towards supplementing the booklets with additional plans, sections, and elevations drawn from field recording notes as well as contemporary (2007-2013) photographs of the buildings, sites and landscapes. A “slide packet” of sorts. If you attended the 2013 Gaspé-Percé VAF and wish to share your photographs, please join the VAF Flickr group at https://www.flickr.com/groups/707006@N24/. Just send a request to join the group, and then it is easy to post and explore the images from other members. Plans for New Years? Reserve Chicago! Resolve to join us in the New Year - June 3rd to 7th - for our annual conference in Chicago! Conference Headquarters will be at Roosevelt University’s Auditorium Building, and our tours will take us “Out of the Loop” to a range of neighborhoods and vernacular spaces. 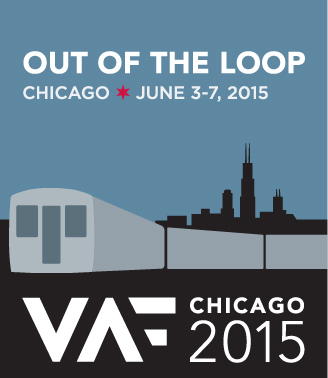 Registration and Lodging options open February 15, and Registration Fees are now posted to the VAF Chicago website. Be sure to join us for our Opening Reception and Plenary at Salvage One, one of Chicago’s most eclectic vernacular spaces. To help you keep your Chicago resolution, VAF Chicago commissioned essays about the city’s architectural landscape and found an alternative to the holiday valet so you know what to look for and where to drop your car once you arrive. The essays feature Patrick McBriarty on Chicago railway bridges and Bill Savage on neighborhood taverns. 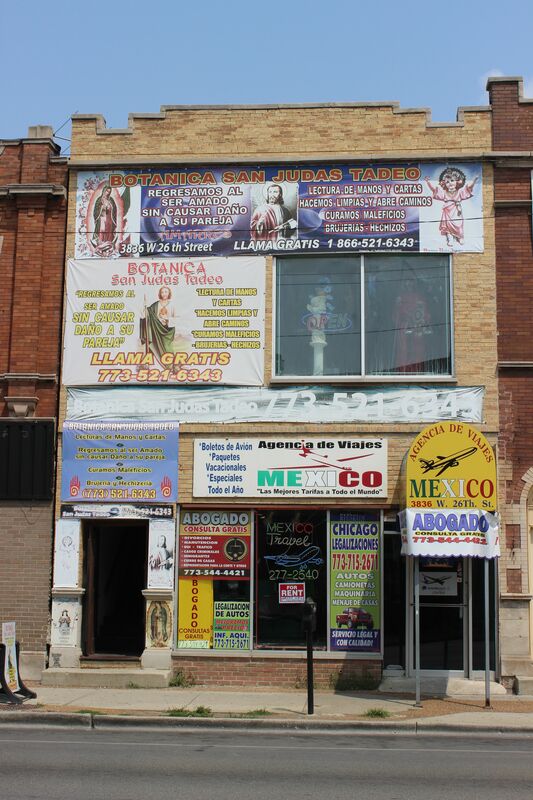 VAF Chicago’s parking page on the website includes a map of nearby options and easy links to Spothero.com and ParkWhiz, to find the best deals. The traditional bread and butter of the VAF is well represented with many potential panels on everyday building types (funeral parlors, gas stations, Mormon stake houses, industrial buildings), as well as numerous papers on historic preservation practice. The strength of international submissions and topics continues to grow. There are more proposal on Chinese vernacular architectures and landscapes than ever before, along with a rise of work about the Middle East (most of it from scholars there), and some superb material on South Asia, reflecting the strength of that subfield. Many of the paper submitters have not previously attended the VAF conference, so we look forward to welcoming many new scholars—and future members--to the Chicago meeting. 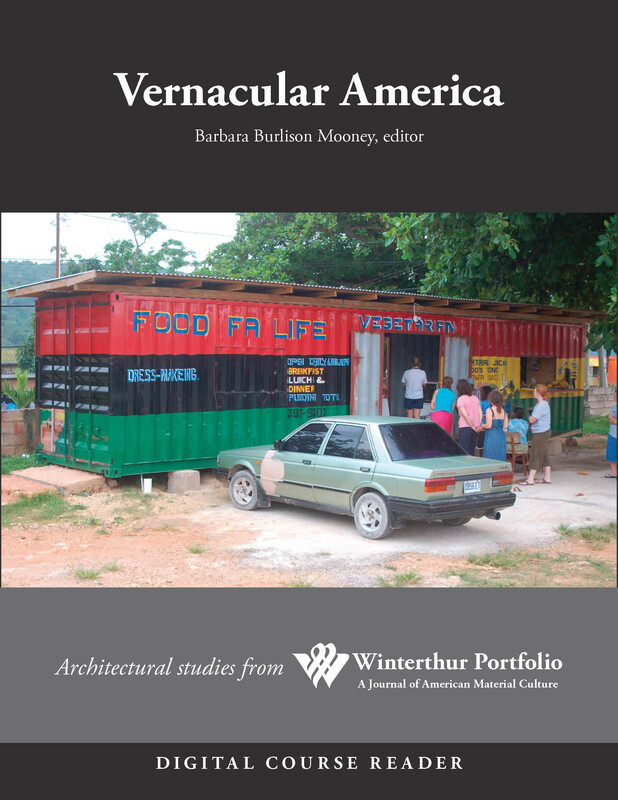 The University of Chicago Press has a new e-book entitled Vernacular America: Architectural Studies from Winterthur Portfolio. The reader compiles thirty years of WP scholarship, from research focused on building practices and materials to pattern books and Victorian mail-order plans, from suburban development to situating buildings in a transatlantic framework. This past May, the Vernacular Architecture Forum welcomed me and two other graduate students from the School of Architecture at McGill University to the annual conference in Down Jersey as part of the Ambassadors Award program. 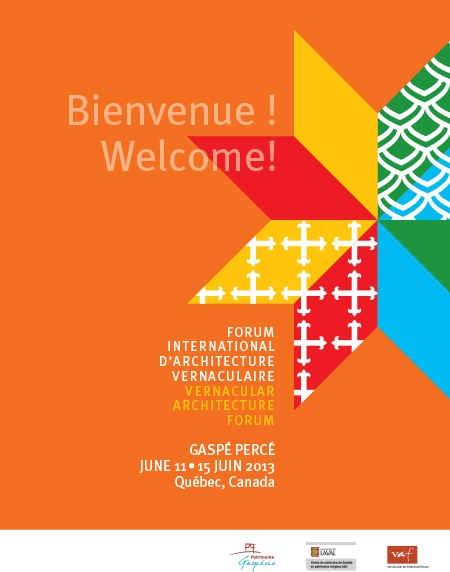 The three of us had attended our first VAF conference together the previous year, when the Forum travelled north of the border to picturesque Gaspé-Percé, Quebec. In the spirit of this transnational exchange, I would like to share a more personal connection from our visit this year, a moment of coincidence between the histories of Margate, a seaside resort on the southerly end of Atlantic City, and St. Thomas, Ontario, a former railway capital in the southwest of the province, and, incidentally, the city where I grew up. 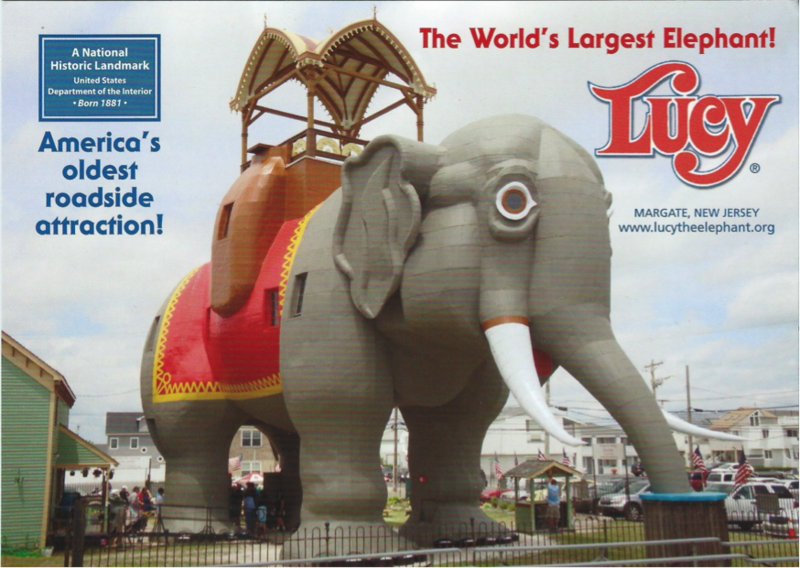 A footnote to the exhibition housed in the giant timber-framed belly of Margate’s famous elephant Lucy names Jumbo (1861-1885), of Barnum & Bailey’s fame, as James Vincent de Paul Lafferty Jr.’s muse in the creation of his patented elephant building. Showcased as “the biggest elephant or mastodon – or whatever he is – in or out of captivity” by legendary showman Phineas Taylor (P.T.) Barnum, Jumbo was arguably the most famous animal in the world during his short lifetime. Born in the French Sudan (now Mali), he was traded to a wild animal collector in Zanzibar and eventually consigned to the Jardins Des Plantes in Paris. Four years later, in exchange for a rhinoceros, he was traded to the Royal Zoological Society of London where he was christened Jumbo, from the Swahili jumbe meaning chief, and celebrated as “the first African elephant to reach England alive”. Jumbo attracted Barnum’s attention while at the London Zoo where he was purchased for $10,000 and shipped onboard the Assyrian Monarch to his new home in New York. Perhaps Lafferty saw the great elephant here, exhibited by Barnum at Madison Square Garden, or somewhere along the railway lines that carried the travelling circus with Jumbo as its star attraction across both state and national borders. The spectacle attracted no shortage of media attention, as Barnum was notorious for sensationalism and the shameless promotion of his enterprise. He was most interested in things gigantic and the first of their kind, and the elephant’s value was directly proportional to the size of his body. Inevitably, Jumbo proved an asset either living or dead. On September 15th, 1885, Barnum’s circus was travelling through St. Thomas, Ontario, a significant railway junction and newly incorporated city. Following the evening’s performance, as the elephants were loading onto their respective railway cars, an unscheduled train travelling along the Grand Trunk Line took the animals and their keeper by surprise. Jumbo was struck by the oncoming train with a force that propelled him down a steep embankment where he died shortly after. Barnum promptly had the hide stuffed and mounted by Professor Henry Ward of Ward’s Natural Science Institute in Rochester as the new showpiece of the circus’s travelling exhibit. Jumbo’s heart was sent to Cornell University in Ithaca and his skeleton to the American Museum of Natural History in New York. After a season of touring, his skin was sent to Tufts College in Medford, Massachusetts, where it was destroyed by fire in 1975. I grew up in the shadow of Jumbo the Elephant, or rather his life-sized replica. 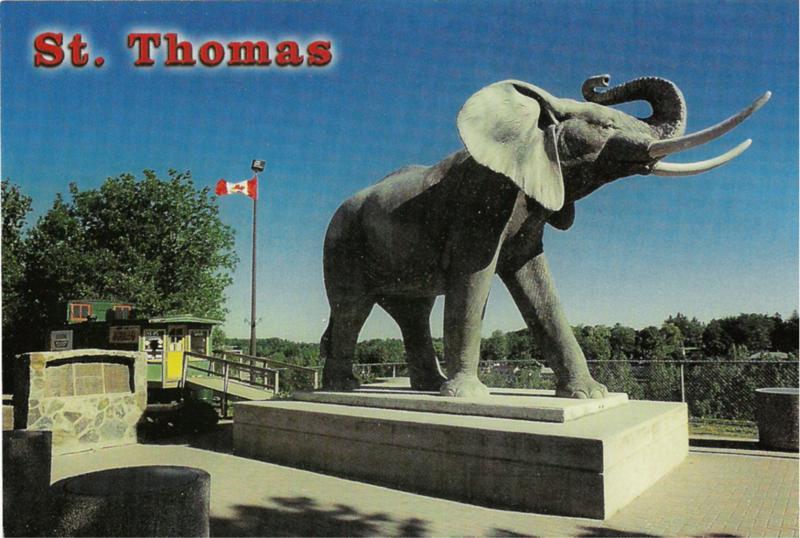 In 1985, in honor of the centenary of the elephant’s death, and in appreciation for a hundred years of world fame, the City of St. Thomas commissioned a statue of the elephant by east-coast artist Winston Bronnum, one of Canada’s leading animal sculptors. Constructed of concrete and reinforced with steel, the statue was poured in two sections to aid its transportation 1,070 miles across the Trans-Canada Highway from Sussex, New Brunswick. The lower part of the legs and six inch base were joined to the upper part of the legs and body by four large concrete pegs on site. Once assembled, the piece weighed thirty-eight tons, the body hollow with 7 inch thick walls, layered with an extra three-quarter inch of textured cement and sand plaster to emulate elephantine skin. The official unveiling of the monument marked the highlight of Jumbo Days, a five-day civic celebration, during which time over 10,000 people were drawn to the site to pay tribute to the elephant. Today Jumbo overlooks the city’s main thoroughfare, adjacent to the Elgin County Pioneer Museum on a site not far from the circus’ original pitching grounds. Those who attended the 2013 Gaspé-Percé VAF will remember the abandoned houses, barns and outbuildings hugging the steeply inclined slopes of the Forillon Peninsula. Summarily recorded soon after the creation of the park, they are the extant remnants of a vibrant, multicultural settlement expropriated over forty years ago. One of the Forum workshops addressed the question of how to best historically preserve and interpret the Grande-Grave cultural landscape in a manner that benefitted both Parks Canada, custodians of the national park, and the three adjacent communities, Cap-aux-Os, Cap-des-Rosiers, and l’Anse-au-Griffon. Some of the stakeholders who participated in the VAF workshop have continued to reflect on this issue; it will be the focus of the 2015 edition of the field school. Over an intensive three weeks, participants will complete existing documentation and in so doing learn fundamental field recording skills – measuring, drawing, photographing, etc. They will compare this data with archival records including audio- and video-recorded interviews with people who had lived in Grande-Grave prior to expropriation. As David Byrn e reminds us, heritage is a vehicle for social action. Past-president of ICOMOS, Gustavo Araoz, among others, have observed a paradigm shift, from a curatorial approach towards historic preservation to one that manages change in historic and contemporary landscapes, which begs consideration of a multiplicity of oft-conflicting values, sociocultural and economic as addressed by recent Getty Conservation Institute publications and other authors. It is in this spirit that we will work with the communities adjacent to the park, namely Cap-aux-Os, Cap-des-Rosiers and l’Anse-au-Griffon, to explore the ways in which complementarity and synergy can be generated between private enterprises, the public sector, and community initiatives to stimulate the development of both the villages and the Park. The activities of the field school, then, not only allow us to look backwards in time, to understand and interpret the past, but also give us a springboard towards the future, to prospect potential uses of the sites. This bilingual (English and French) intensive three-week field school, offered through the Université Laval School of Architecture will be especially of interest to those wishing to develop their field recording techniques, to learn to interpret buildings and sites, to work with local interest groups in community development, and to sensitively intervene in regional cultural landscapes. We are now accepting applications from advanced undergraduate and graduate students as well as professionals of all disciplines interested in built heritage! Course coordinator: Tania Martin, Canada Research Chair in Built Religious Heritage and Full Professor at the School of Architecture, Université Laval. Byrne, Denis. “Heritage as Social Action” in Graham Fairclough, Rodney Harrison, John H. Jameson Jnr, and John Schofield, eds. The Heritage Reader (New York: Routledge, 2008): 149-173. Allen-Kim, Erica S. “Exile on the Commercial Strip: Vietnam War Memorials in Little Saigon and the Politics of Commemoration.” Buildings and Landscapes 21, no. 2 (Fall 2014): 31–56. Bettley, James. Suffolk: East (The Buildings of England). New Haven: Yale University Press, 2015. ———. Suffolk: West (The Buildings of England). New Haven: Yale University Press, 2015. Beveridge, Charles E., Lauren Meier, and Irene Mills, eds. Frederick Law Olmsted: Plans and Views of Public Parks. Baltimore: Johns Hopkins University Press, 2015. Borges, Sophia, Sven Ehmann, and Robert Klanten, eds. Building Better: Sustainable Architecture for Family Homes. Berlin: Gestalten, 2014. Bramwell, Lincoln. Wilderburbs: Communities on Nature’s Edge. Seattle: University of Washington Press, 2014. Brown, Nic. “Small-Town Renaissance.” Preservation, Spring 2014. Buxbaum, Tim. Icehouses. Oxford: Shire Publications, 2014. Cílek, Václav. To Breathe with Birds: A Book of Landscapes. Translated by Evan W. Mellander. Philadelphia: University of Pennsylvania Press, 2015. Conwill, Joseph D. Covered Bridges. Oxford: Shire Publications, 2014. Daley, Susan, and Steve Gross. “Extra Ordinary: Vernacular Architecture.” Preservation, Fall 2014. Dilley, Thomas R. The Art of Memory: Historic Cemeteries of Grand Rapids, Michigan. Detroit: Wayne State University Press, 2014. Ehmann, Sven, and Sophia Borges, eds. Rock the Shack: The Architecture of Cabins, Cocoons and Hide-Outs. Berlin: Gestalten, 2014. Ferry, Kathryn. Bungalows. Oxford: Shire Publications, 2014. Fisher, Lewis F. American Venice: The Epic Story of San Antonio’s River. San Antonio: Trinity University Press, 2014. Frank, Robin Jaffee, ed. Coney Island: Visions of an American Dreamland, 1861–2008. New Haven: Yale University Press, 2015. Froissart, Rossella. “Socialization of the Beautiful and Valorization of the Useful: The Decorative Arts in France, from the Utopias of 1848 to Art Nouveau.” West 86th 21, no. 1 (March 2014): 69–101. doi:10.1086/677869. Gutman, Marta. A City for Children: Women, Architecture, and the Charitable Landscapes of Oakland, 1850-1950. Chicago, University of Chicago Press. Heath, Kingston Wm. “Viewpoint: Buildings as Cultural Narratives: Interpreting African American Lifeways in a Montana Gold Mining Camp.” Buildings and Landscapes 21, no. 2 (Fall 2014): 1–30. Hodge, Christina J. “Consumerism and Control: Archaeological Perspectives on the Harvard College Buttery.” Northeast Historical Archaeology 42, no. 1 (2013). Howard, Jeffrey L., Krysta Ryzewski, Brian R. Dubay, and Thomas W. Killion. “Artifact Preservation and Post-Depositional Site-Formation Processes in an Urban Setting: A Geoarchaeological Study of a 19th Century Neighborhood in Detroit, Michigan, USA.” Archaeological Science 53 (January 2015): 178–89. Jackson, Donald C. Pastoral and Monumental: Dams, Postcards, and the American Landscape. Pittsburgh: University of Pittsburgh Press, 2013. Justice, George. Courthouses of Georgia. Athens, GA: University of Georgia Press, 2014. Kapp, Paul Hardin. The Architecture of William Nichols: Building the Antebellum South in North Carolina, Alabama, and Mississippi. Jackson, MS: University Press of Mississippi, 2015. Koller, Alexander, and Jess Koller Lumley. “Strategies of the Bulgarian Vernacular: Continuity in Bulgarian House Design from National Revival Times to the Present Day.” The Journal of Architecture 19, no. 5 (2014): 740–78. Longstreth, Richard, ed. Frank Lloyd Wright: Preservation, Design, and Adding to Iconic Buildings. Charlottesville, VA: University of Virginia Press, 2014. MacKay-Lyons, Brian. Local Architecture: Building Place, Craft, and Community. New York: Princeton Architectural Press, 2014. Martens, Steve C., and Ronald L. M. Ramsay. Buildings of North Dakota. Charlottesville, VA: University of Virginia Press, 2015. Meister, Maureen. Arts and Crafts Architecture: History and Heritage in New England. Hanover, NH: University Press of New England, 2014. Moss, Hilary, Yinan Zhang, and Andy Anderson. “Assessing the Impact of the Inner Belt: MIT, Highways, and Housing in Cambridge, Massachusetts.” Journal of Urban History 40, no. 6 (November 2014): 1054–78. Novotný, Martin. “A Late Reverberation of Antiquity in Vernacular Architecture of Moravia.” International Journal of Historical Archaeology 18, no. 4 (December 2014): 629–42. Petty, Margaret Maile. “Threats and Promises: The Marketing and Promotion of Electric Lighting to Women in the United States, 1880s–1960s.” West 86th 21, no. 1 (March 2014): 3–36. doi:10.1086/677867. Randl, Chad. “‘Look Who’s Designing Kitchens’: Personalization, Gender, and Design Authority in the Postwar Remodeled Kitchen.” Buildings and Landscapes 21, no. 2 (Fall 2014): 57–87. Ridge, Ryan. American Homes. Ann Arbor: University of Michigan Press, 2015. Ridout V, Orlando. “Reediting the Architectural Past: A Comparison of Surviving Physical and Documentary Evidence on Maryland’s Eastern Shore.” Buildings and Landscapes 21, no. 2 (Fall 2014): 88–112. Schweber, Nate. “Small Wonders: Montana’s Schoolhouses.” Preservation, Fall 2014. Shettleworth, Earle, Christopher Glass, and Scott T. Hanson. Homes Down East:Classic Maine Coastal Cottages and Town Houses. Thomaston, ME: Tilbury House Publishers, 2014. Snider, Bruce D. “In Good Company: Company Towns Across the U.S.” Preservation, Summer 2014. Stiefel, Barry L., and Jeremy C. Wells, eds. Preservation Education: Sharing Best Practices and Finding Common Ground. Hanover, NH: University Press of New England, 2014. Stilgoe, John R. Landscape and Images. Charlottesville, VA: University of Virginia Press, 2015. Striner, Richard, and Melissa Blair. Washington and Baltimore Art Deco: A Design History of Neighboring Cities. Baltimore: Johns Hopkins University Press, 2014. Valestrand, Halldis Elina. “Text and Object: The Bus Shelter That Became Cultural Heritage.” International Journal of Heritage Studies 21, no. 1 (2015): 81–98. Walker, David W., and Matthew Woodworth. Aberdeenshire: North and Moray. New Haven: Yale University Press, 2015. Walser, Lauren. “Springs Fling: Palm Springs’ Other Architectural History.” Preservation, Fall 2014. Ward, Logan. “Virginia Underground.” Preservation, Spring 2014. Willes, Margaret. The Gardens of the British Working Class. New Haven: Yale University Press, 2014. Yacobi, Haim, and Hadas Shadar. “The Arab Village: A Genealogy of (post)colonial Imagination.” The Journal of Architecture 19, no. 6 (2014): 975–97. Zipf, Catherine W. “Research Notes: The Trials and Tribulations of Mapping Colonial Newport.” Buildings and Landscapes 21, no. 2 (Fall 2014): 113–20.